This is one of Herr's best looking bags. 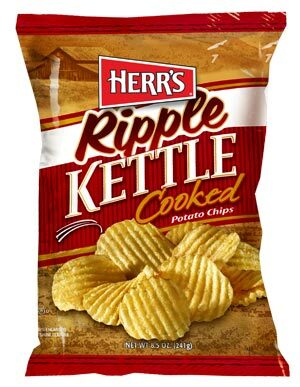 The sepia toned background image gives the customer perspective - Herr's have been making Chips for a long time. The dark red is a great contrast. The image of the Chips looks inviting. The wording in the centre is proportionate in size. We don't know what the little whoosh lines are for, but overall it is very aesthetically pleasing. As these Chips were not as thick as some Kettle Cooked Chips, they veered towards the Ripple comparisons - and in this department they stood up for themselves! A good, crispy crunch. They didn't melt in the mouth too quickly as the snappy munch continued. While some companies refer to their Wavy Chips as 'Ridged' these are most certainly Rippled. A gentle undulation, rather than crevice like avenues. They appeared to be just about thick enough to sustain a mostly intact bag full of whole Chips. There was more oil visible than seasoning. For some reason, Herr's has a wide range of potato and salty flavored Chips. In a world of variety and flavor, it is somewhat surprising that they manage to keep so many differently named similarly tasting Chips alive. Again, these featured a warm, potatoey flavored, slightly salty snack.